Surrrounded by glorious countryside, Much Wenlock is a walkers paradise and has been awarded Walkers are Welcome status. For those wishing to lean about Much Wenlock’s links with the birth of the modern Olymoic Games there a designated walk around the town. You can also get copies of the trail leaflet at Much Wenlock Museum and Visitor Information Centre. With a wealth of historic buildings and our Olympian heritage the town is perfect for an afternoon’s stroll. The Wenlock Rural Walks are five short circular walks which start at the clock tower in Much Wenlock square, opposite the Guildhall and the museum. All are less 5km, and each one can be walked in two hours or less. Download our rural walks here. Much Wenlock was awarded Walkers are Welcome town status in July 2011. 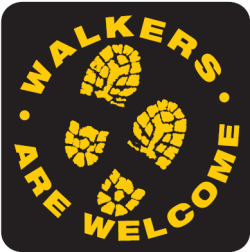 After public consultation, and support from traders and the town council, the town can now proudly present the Walkers are Welcome logo. Walkers are Welcome is a national scheme, with over 70 towns involved in the network. It helps to promote towns who are walker friendly and have something special to offer. Businesses can also be involved in the scheme by having the logo present in their premises, so that walkers know that they are welcome! Walkers are Welcome aims to strengthen the reputation of the town as a great place to come and visit, to attract more people to Much Wenlock and benefit the local economy. Through obtaining Walkers are Welcome status, Much Wenlock is linked in with the national network of towns. This will allow for more cross-promotion between the Shropshire towns, to strengthen the walking offer throughout the Shropshire Hills.